We are proud to introduce our new Doonie Visa Debit and ATM cards. Yes, he’s adorable. He also represents the journey of the OneUnited Bank team to embrace an important tradition within the Black community – nicknaming our children. Doonie is the name of the painting by the internationally acclaimed artist, Addonis Parker, and one of his nicknames as a child. Even though everyone on our team loves the painting and the name, we struggled with the decision to name the card “Doonie”. We reflected on the powerful names of our other cards – Mona, Amir and Lady Liberty – and began to search for a similar “powerful” name for our new card. We considered biblical names such as Isaiah, Zion and Elijah. We considered names that represent #BlackLivesMatter and the social justice movement, such as Malcolm and Justice. We even considered popular names such as Brandon, Malik and Jayden. As the largest Black owned bank in the country, we recognize the importance of a name, for our community and our children. So we openly discussed our concern about using a nickname – an informal name for such a beautiful Black boy, which could be misinterpreted as a lack of respect. We eventually decided to honor the name given by our artist and respect our tradition of nicknaming our children by embracing Doonie! Conventional? Maybe not. Authentic? Absolutely! And more importantly, lovable! 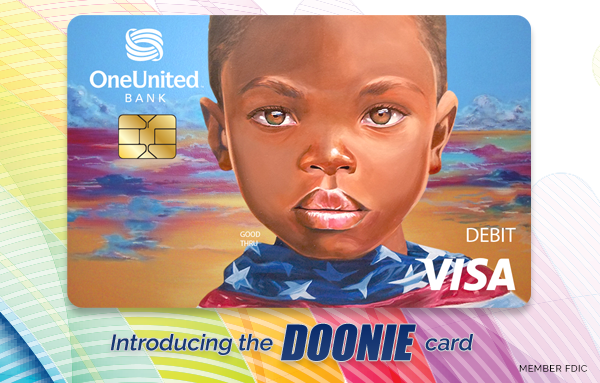 With your Doonie Visa Debit or ATM Card, you show the power of the $1.2 trillion of annual spending of the Black community and that #BlackMoneyMatters. You also show the love we have for our children, our Black boys. And best of all the Doonie Card gives you access to 25,000 surcharge-free ATMs across the country. We hope you love Doonie as much as we do and invite you to share with us some nicknames in your family. Get your Doonie Card today so that you can #BuyBlack every day! How do you increase the credit limit on the secured card? Customer service is not helping me at all! Hi Irene, we are so sorry to hear that your are having trouble getting help with this. At this time only our Customer Support team can assist with increasing a credit limit on a secured card account. If you have not yet opened a UNITY Visa Secured Card with us, your initial funding amount sets your card limit, and you can open a UNITY Visa Secured card for as little as $250 and up to $10,000. Again we are so sorry to hear you are having trouble getting help. If you have any additional questions, just let us know. We’re happy to help. This is a welcomed addition to my wallet! The card is beautiful. I love it. I can't wait to obtain one. Good job. This is my most favorite card yet! Beautiful! I get your emails all the time, and even though I am not a account holder I love reading your articles. I just read the one on your new Doonie Visa Debit and ATM Card. I think the card is great, it's a beautiful picture. I live in Indiana and have seen your cards , i like the Doonie the Best! I'm pleased. And I'm very much interested to be apart. However I do not think your bank is in my location. Twin Cities of Minnesota. If you currently have a OneUnited Bank Visa Debit or ATM card and would to replace it with a “Doonie” designed card, simply log in to online banking and under Additional Services (top right corner), select and complete the Choose Card Design form. Your new card will have your existing account number (your account number will not change) and will arrive within 14 days. And don’t worry… your existing card will work until your new card is activated. i would love to have that card in my wallet. I applied for an account earlier this year but, was unsuccessful. I felt bad about the process because. I really want to do business with my own community. Sometimes, we are difficult. We're sorry to hear you are having difficulty opening an account with us. While there are certain criteria that you must meet to open an account with us, we'd like to help if we can. Please call our customer support team at 1-877-663-8648 to see if there is a way that we can successfully open an account for you. This is quite a wonderful thing you all have done. I am very much impressed. You have displayed courage, by not being held to the conformities of corporate America. You have also shown honor to a part of our Black American Heritage. Thank you so very very much. P.S. I hope to open an account with you all very soon. I love it! Very adorable, yet powerful! I love it! He is adorable! Thank you for embracing us! When can I get the new bank card I love this one. I also need someone to contact me about my cd before it rolls over I want to add more money to it. Also my family and friends in Tulsa, Oklahoma, are interested in doing business with you. The Muslims want a black bank I told them about you so can you post on facebook to me Diane Comres and I will keep sharing it. Also the person in Oklahoma, name is ALVIN James Mohammad? On the spelling of last name. A beautiful card with a purpose! I Love it! Getting mine now! Hi Nelson, we would love to help you with this. You can contact our Customer Support team here: https://www.oneunited.com/customer-service/contact-us/ or by calling (877) 663-8648. I would like more information on the bank, the atoms, and services offered to account holders. Who are the stock holders of the bank? How to become a stock holder? Beautiful, I have to have this card in my wallet. I think it is an amazing tribute to our culture and heritage. My "call" my grand daughter "Doonie", it touched me that it could actually be a common nickname. What's funny is her name doesn't have a 'd' in it!!!! In my family we pick out the nickname according to how we feel and she reminds me of a Doonie.Thank you for keep it Black! How awesome is this. My fiance's nickname is Doonie. He was born in 1973. When I saw this on Facebook, I immediately took a screenshot and sent it to him and his jaw dropped to the floor. I was so thrilled to see this. the little boy n the front of the card is so beautiful. We will be getting cards soon. Thanks One United Bank.